While efforts at integrating gender considerations into climate change and energy have progressed over a number of years, they tend to focus on the household scale and there is a significant knowledge gap on gender and large-scale renewable energy, as well as the gender implications of large-scale climate change mitigation strategies. In September 2014, the GECCO initiative* conducted a literature review, as well as individual consultations with experts and an experts’ workshop to consider the most recent work on the intersection of gender and energy and identify missing information. The resulting report informs GECCO’s* energy work, as it will support the energy sector and large-scale climate change mitigation approaches to be gender responsive by filling knowledge gaps for integrating gender into the energy sector through sharing existing knowledge and encouraging documentation of experiences and new knowledge creation. What is GECCO* Energy doing? Supporting climate change mitigation strategies, like Low Emissions Development Strategies (LEDS) and Nationally Appropriate Mitigation Actions (NAMAs), to be gender-responsive. In order to share existing knowledge on gender and renewable energy, GECCO* has established a network of experts as well as an interactive electronic platform that encourages information exchange and showcases the latest available resources on gender, energy, and climate change mitigation planning. The GECCO* network of experts brings together specialists in the area of gender, the environment and renewable energy, interested in advancing knowledge on gender implications of renewable energy policies and medium to large scale projects. 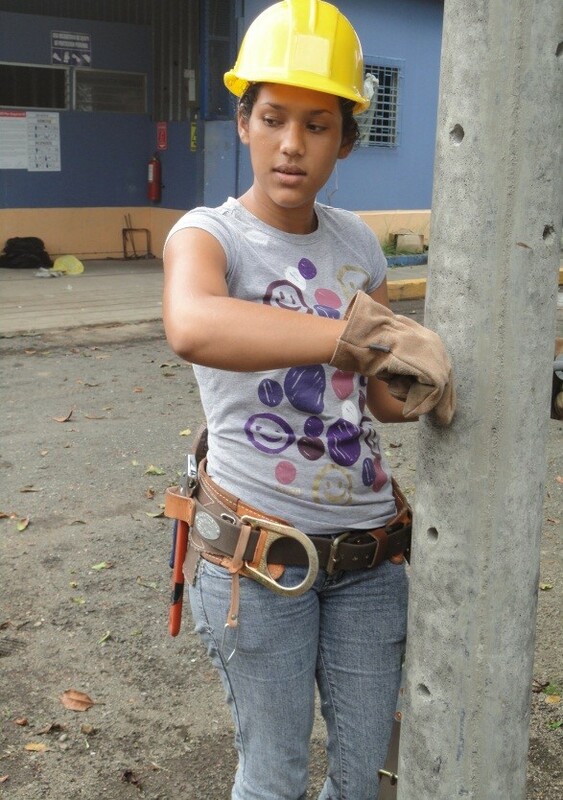 Linewoman (powerline technician) at work, ENATREL/PELNICA, Nicaragua. Credit: Ing. Jose Ramon Zeledon, PELNICA. One of the goals of GECCO*, as validated through consultation with experts at the aforementioned workshop, is to create and link working group discussions with the generation of new knowledge products, the design and implementation of webinar series that will increase outreach and knowledge sharing on gender and renewable energy, and the creation of an electronic resource center where key and recent documents on gender and energy can be easily accessed. Women’s access to affordable and appropriate clean energy is enhanced through gender responsive clean energy investments. In addition, GECCO* supports the work implemented under the Low Emission Development Strategies Global Partnership (LEDS-GP), particularly its Energy Working Group (EWG). LEDS-GP is a global effort to advance climate-resilient low emission development through coordination, information exchange, and cooperation among programs and countries. GECCO* is working to provide a better understanding of the gender dimensions of LEDS, encourage discussions on the topic and identify concrete ways for providing further support to LEDS-GP and EWG as a means to inform gender responsive LEDS and NAMAs. For those interested in staying up-to-date with GECCO’s* discussions and information sharing, but aren’t interested in being a part of a working group, you can still join the general network and receive first-hand information on new developments. Overlooking women’s contributions to addressing climate change can result in lost opportunities to achieve multiple benefits—gender equality and women’s empowerment could open the door to greater strides to better overall development outcomes, including reducing greenhouse gases and building resilience to climate change impacts. Join us in implementing GECCO Energy and help us build a clean, sustainable, and just future that empowers women!